I'm back to share with you all another adorable little card! I have gone absolutely bonkers over the little critters in the stamp set! How stinkin' cute is the little platypus?? When I first saw him I immediately knew this set was going to be a favorite. 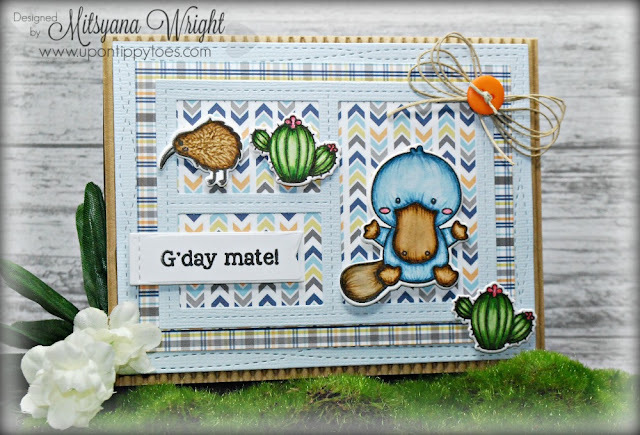 And check out the cute little cactus and Kiwi bird... that was it, I'm dead... this set just killed me with cuteness!! To make this card, I first stamped my images from Pink and Main's Koalaty Friend set with VersaFine Onyx Black Ink onto Strathmore Mixed Media Paper. 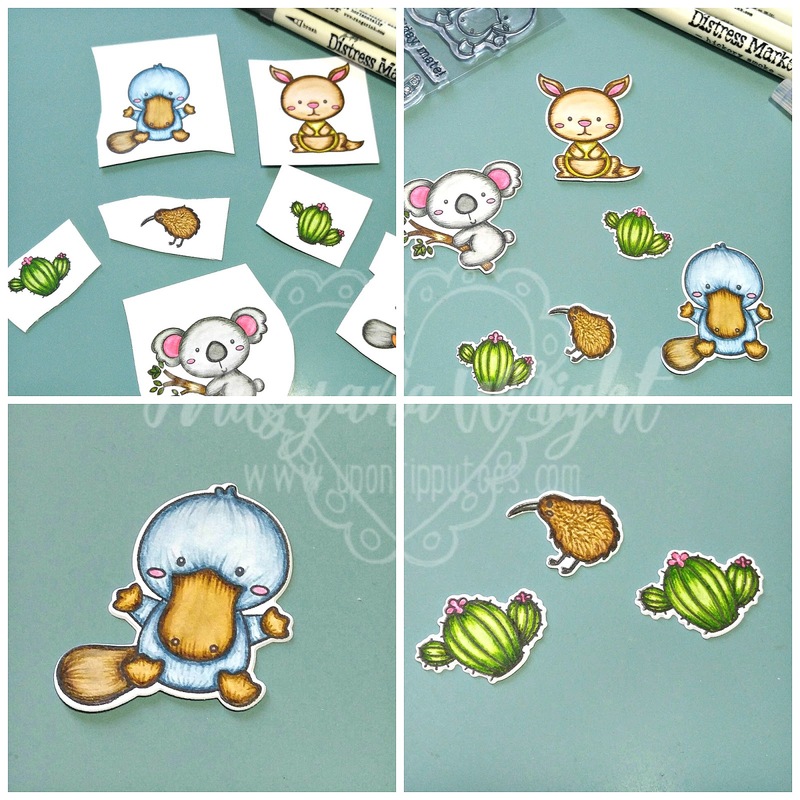 Then I colored these cute little critters with Tim Holtz Distress Markers. For the platypus, I used Stormy Sky and Vintage Photo. ]The cacti were colored Mowed Lawn and Worn Lipstick. And the little Kiwi bird was colored in Vintage Photo. Once I the coloring was done, I die cut the images using Pink and Main's matching Koalaty Friend Dies. For my card base, I used these awesome patterned papers from Pink and Main's new Be Brave 6"x6" Paper Pad. I framed and layered them onto a standard A2 (4.25"x5.5") corrugated cardstock card base. The bigger rectangle mat measures 4"x 5.25" and the smaller rectangle measures 3"x 4.25". I also used MFT's Wonky Stitched rectangles to layer over the large rectangle mat and Blueprints 29 to layer over the smaller rectangle. I stamped my little sentiment on the little flag, also from the Blueprints 29 set. I used foam adhesive to pop up my images and adhered them to the front of my card. Then finally added a twine bow topped with an orange button. I cannot get enough of this little platypus!! And the kiwi bird is the perfect little sidekick to any of the cute animals from this set. Hope you enjoyed this quick and easy card today.